After stopping at the local shop to buy some goods for what seemed could turn into a very long day, and being referred to as the weird Americans who do not like plastic bags (the plastic bag culture in Russia and a lot of parts of the world is still too popular to be called in any way healthy, since almost every item needs to be put in a separate carry bag), we were finally on our way out of the city. Dainis had cycled away some time ago but Ivars and I were still crawling out of town. After some time by the road, we were eventually lucky to flag a car at the last minute. A Black Mercedes van with dark tinted windows and did not know what to expect from behind the black glass. 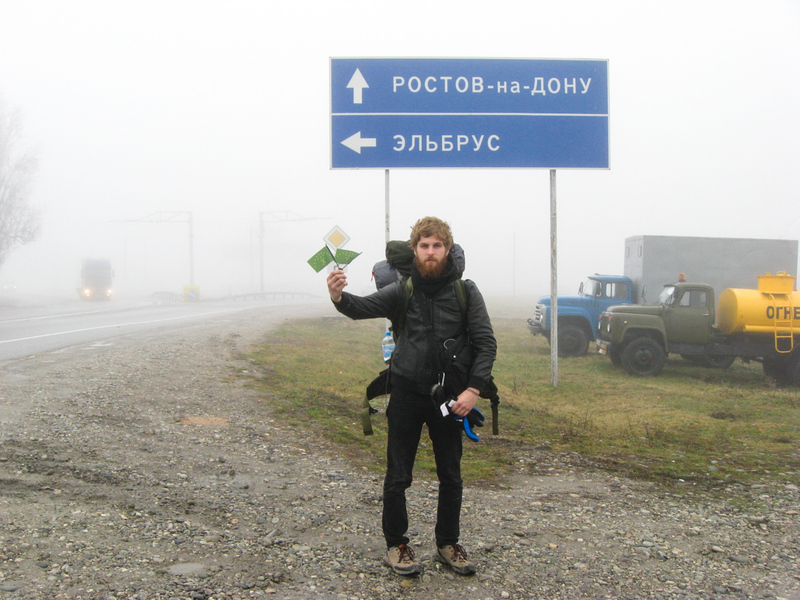 We were instantly greeted by a very positive looking and sounding man called Leonid or just – Losha. Storming south to make it in time to his home town where he would have a gathering in their Baptist parish, he was interested in our story and where we are heading. Soon enough we saw Dainis pedalling in the fog and picked him up too, along with it came also an invitation to join him and his friends at the gathering and tell our story to them too. 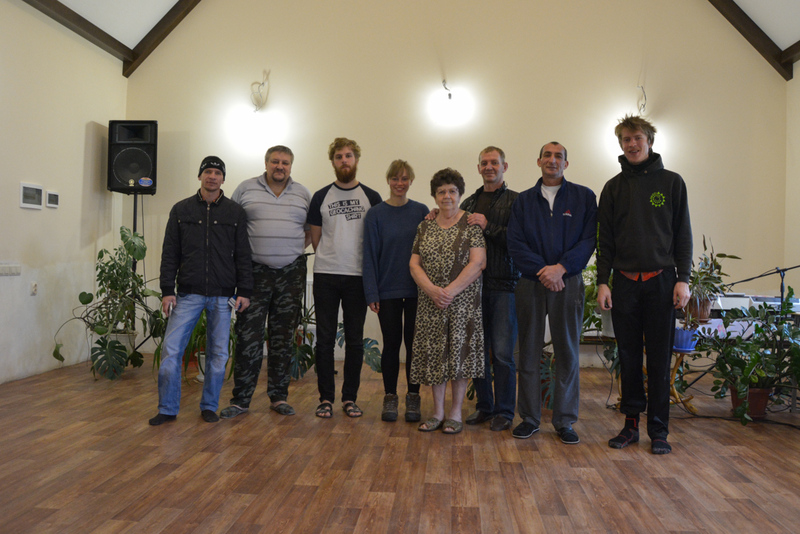 What we definitely did not expect was the kindness we encountered from the people of the town Zolskaya (Зольская), particularly the people of the Baptist Parish and that we could learn from them and be inspired by their stories and the good deed they do for the surrounding community, helping people with addictions to find a way out. Hitchhiking in Kabardino-Balkaria is not actually difficult, the drivers quite often stop and are willing to give a lift, there was only one problem with our experience – the lifts were of a very short distance that day (often only 4-10 km long), so we managed to cover 80 kilometres that day with 6 cars, thanks to the last driver –Asker, who very persuasively invited us to his house for some tea & coffee, which resulted in some vodka drinking and pickled tomatoes, which resulted in some 90% abv clear spirit drinking and beef shashlik, which resulted in more vodka and pork sausages, all of which would not be allowed for Asker and his two brothers, since they were Muslim. However, since the parents were gone to visit relatives for a few days and since all of this happened inside the house, an exception could have easily been made. I must add that the overly friendly reception, had started to wear me out a little after repeated friendly and more than friendly attempts from our host to invite me for a walk to hot springs and Askers immense willingness to sit next to me and make jokes about marriage proposals. Even if it was sometimes with a comment in the end of it, being just as a joke, there was no butterflies in my stomach from that. As hosts, the brothers were very cheerful and hospitable, however, the youngest one, I felt, was more like a servant and did all the work, and got bossed around by anyone’s liking – suppose that is custom in Muslim families, but does that make it ok? After the hearty welcome and drinking the previous night, none of us were feeling that fresh the next morning, but I was happy to leave the unexpected host’s home, even with a twisting stomach and a hangover the size of Russia. The feeling that the situation could have been a lot different, had I travelled alone (not with 2 guys) did not leave me and as comic as it might seem from the side, then – it felt true. It was cold and snowing, but our worries about hitching a ride at 7 a.m. were soon erased. We managed to get a lift mere 15 minutes or so after being on the road and Ivars and I found ourselves in a big, warm and dry Toyota, storming in the direction of North Ossetia. After a while an unwelcomed hello from my stomach greeted my gloves – the aftermath from the celebration the night before. So we had to ask for the car to stop, however, the driver, did not leave us on the side of the road – instead he tried to help (turned out, he was a doctor on his way to work). Excusing myself and murmuring it was probably something I had eaten, we got back in the car and drove on. Beslan was not in the driver’s right direction, so after giving us a lift more than half way there, he left us by a roadside sanctuary, saying it would be easier and safer for us to get a lift there, than ordinary crossroads, since the place was a sanctuary for male travellers, who often stopped there with cars, to be blessed with good luck. I was happy enough we had stopped and I had the opportunity to change my clothes, while Ivars went to explore the place. 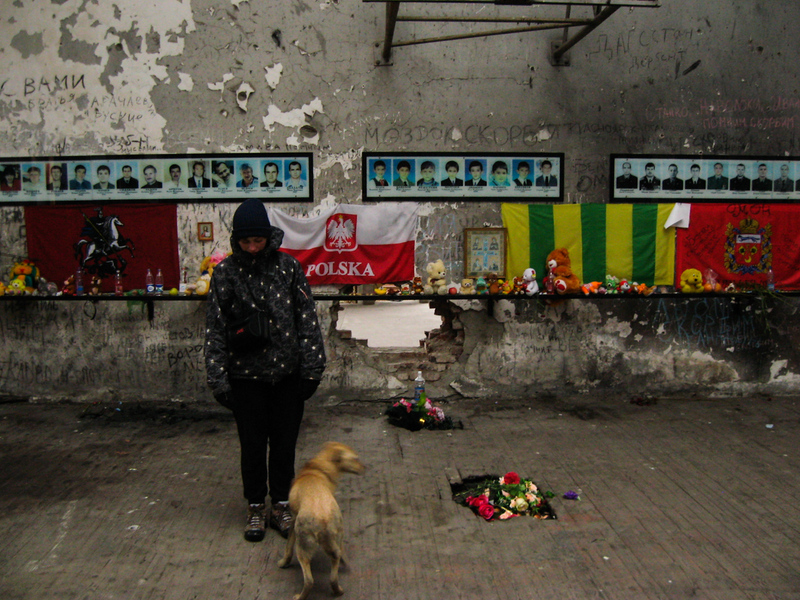 And soon enough, a man approached us and offered to give us a ride to Beslan. Offering warm coffee and sweets, which I warily excused. After finding out our nationality, he was keen to tell us about one of the loves of his life – Jola (short for Jolanta), who was Latvian as well and how they almost got married. So it came to happen that we were in Beslan at 9.30 a.m. already and had plenty of time to explore the city before Dainis would arrive. After walking through the city, whose cafes were still asleep we found ourselves crossing a square that resembled a bus station, next to train tracks with some marshrutkas and taxis about and most importantly – a lot of middle aged men around them. We took some shelter from rain in the train station nearby and 2 minutes later were approached by the same men we had seen beforehand. They started to form a sort of queue and one after another – offered us their taxi services all of which we refused, but that did not discourage the next to try their luck nonetheless. 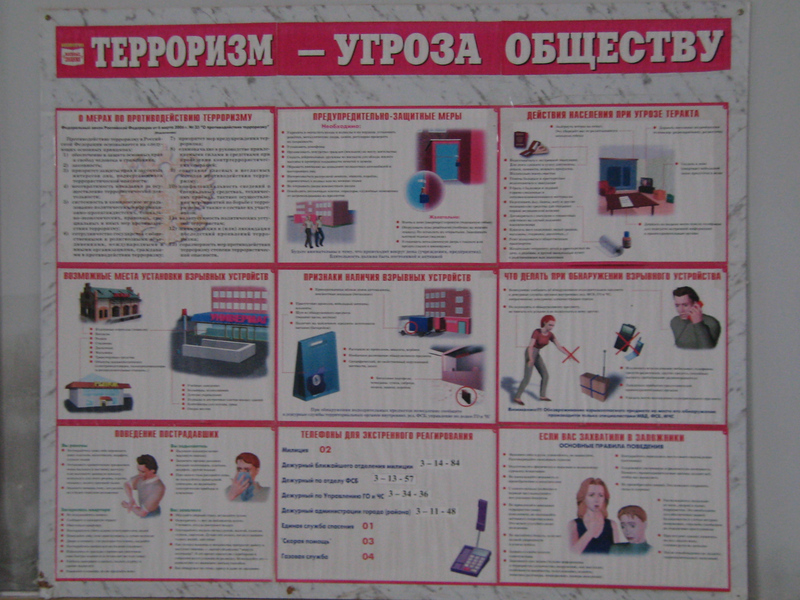 At the train station we also noticed some posters and warnings to be cautious of terrorists. 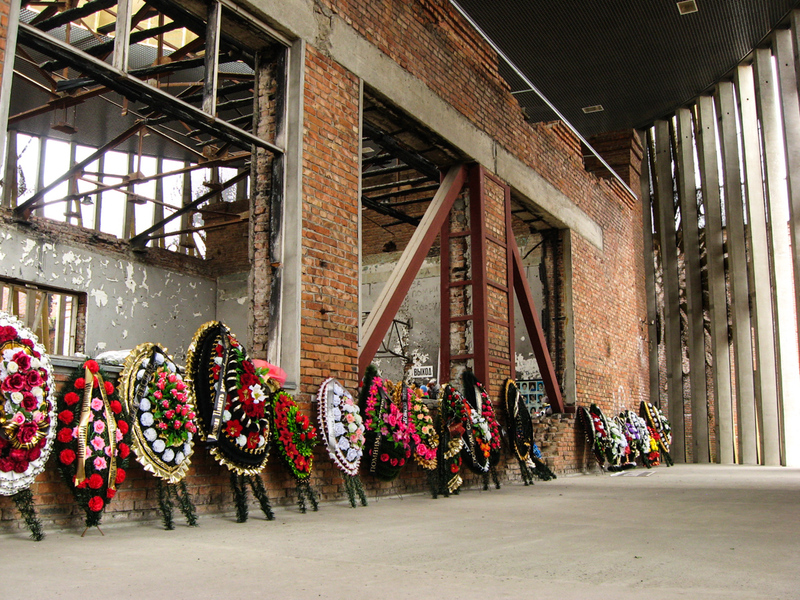 This however was somewhat understandable in Beslan, remembering the events of 1st September, 2004. We decided, to visit the school where the Beslan hostage crisis took place, since it has been made into a memorial, however, we did not know, where to find it, there was no internet at hand, nor did we know how to ask somebody for the directions to a place, where the event occurred without accidentally insulting them. But having set out for the post office to send some post cards anyway, we thought it might as good a place as any to ask. Coincidentally, he managed to ask about the location of the school to a young woman there, who turned out to have been in the school at the time, but had nothing against us wanting to visit the place and gave the instructions to Ivars. Meanwhile, Ivars had been noticed by a man, who had overheard a part of the discussion and approached us once Ivars was outside the post office. The older man had been near the school when the events took place and worked as a fireman when the rescue occurred. After some time, he said, he would be happy to take us there. 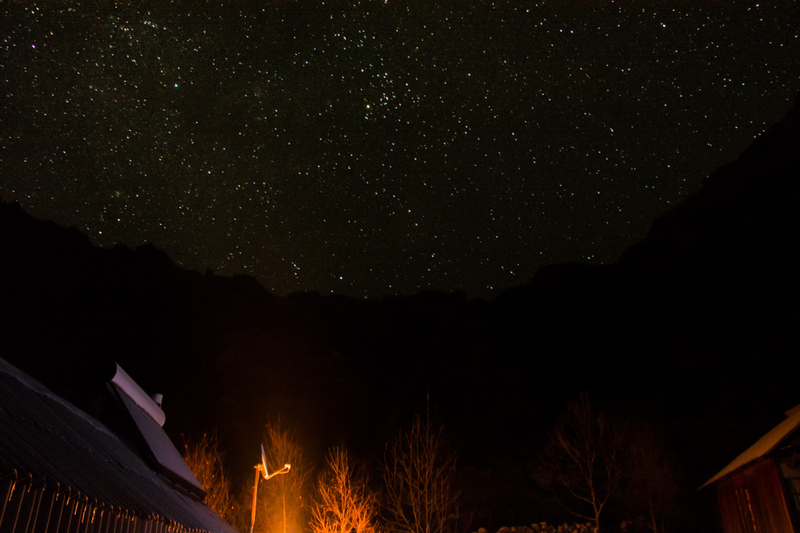 We were also reminded countless times by the little group of people that had started to form around us that we are in North Ossetia and it is not safe at all for foreigners, not to mention camping and the season of the year – winter! Soon after we had started walking to the school (which took us 3 times longer than necessary, since it seemed that Petrov had forgotten where the school actually is) we were stopped by a police car and asked: “Are you ok?” To which our new friend rushed to reply: “We are, yes!” After – he secretly advised us that we should not trust the police system at all, and be as inconspicuous as possible. 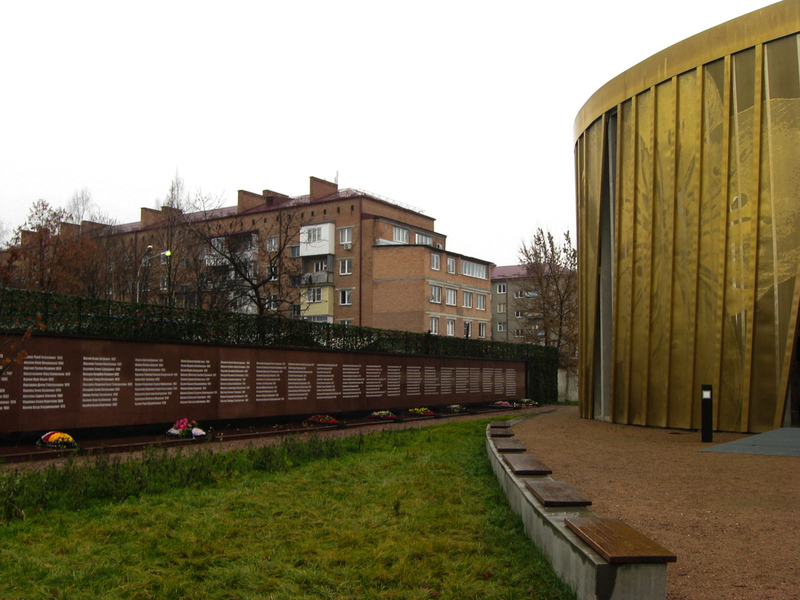 Eventually we got to our chosen destination – the memorial. 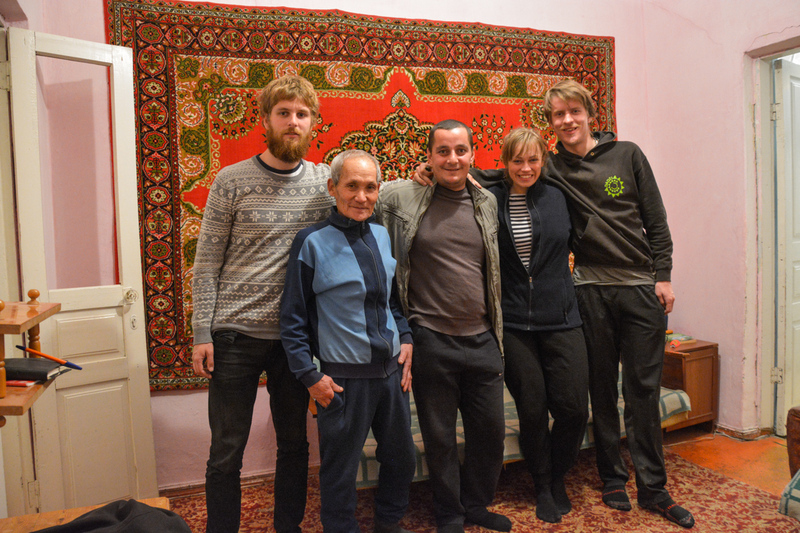 We were also invited to our new guide’s home for some warm drinks and even to stay there overnight, since it would be a suicide to camp somewhere in an area that dangerous (not before Petrov had had 101 doubts in his head about us – suspicious characters, as he later revealed). By the time we were heading to our new hosts place, it was early afternoon and Dainis had arrived in town, we were reunited once again. Having seen that our story must have been true and we had not been lying to him about our travels and the mystery third team mate, we seemed to have gained Petrov’s trust and recognition, or maybe he just had a soft spot for Dainis and his courageous cycling. Thus we spent the afternoon, evening and night listening to our host’s stories and experiences, he seemed to want to share quite eagerly, and that was great( even if some of the events seemed quite strange to say the least), for once, it was our time to listen. But since I was still feeling the aftermath from our previous night’s off-the-leash drinking, I fell asleep somewhere between the story of his assassin skills in the army days and his love for Asian and natural medicine – so Dainis can definitely fill you in on most of them much better. When walking out of the town the next day, we were stopped by some police officers driving by and we were asked to present our passports (warned heartily not to trust the officials by our host countless times, we showed the men in uniforms our papers in the end) just to be stopped about 300m later at the police check point once again, by different officials this time, who asked us to put down our backpacks, present our papers and come inside the roadside police office/station. Thinking that we are most probably very deep in something nasty, without having done anything bad, we went inside. Turned out (2 minutes later) that the officials were just taking a note of our details to spread the word to other checkpoints about our location in the area and means of transportation. 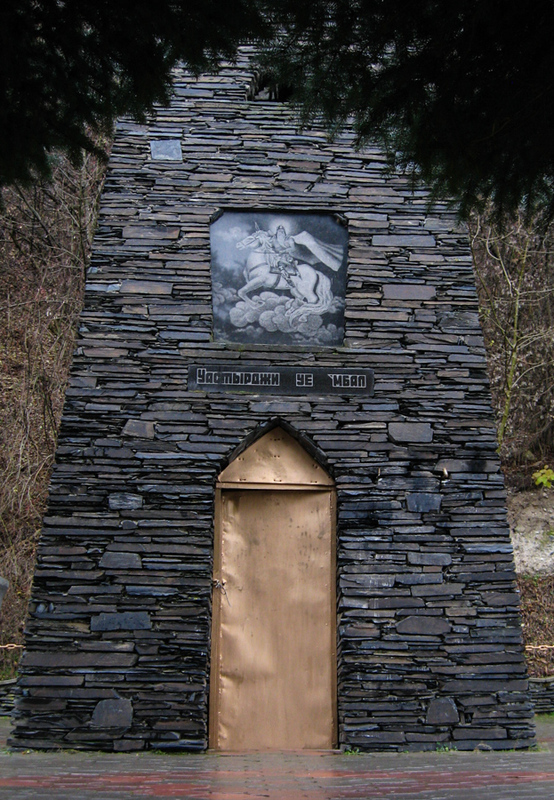 After an unsuccessful attempt to persuade us to take the bus to the border of Georgia or at least the city – Vladikavkaz, they even tried to persuade one of their colleagues to give us a lift, to which the other party replied “What will that do to us?” After such unsuccessful presentation of control in their own district, the officers went for the next best thing – they stopped a car on the road, and after making several excuses and making the driver take an alcohol test ordered the innocent driver take us to the next police check point. Feeling quite uncomfortable and very awkward about the situation at first, we soon found out, that he driver was genuinely pleased to have company and was actually going to Georgia himself. 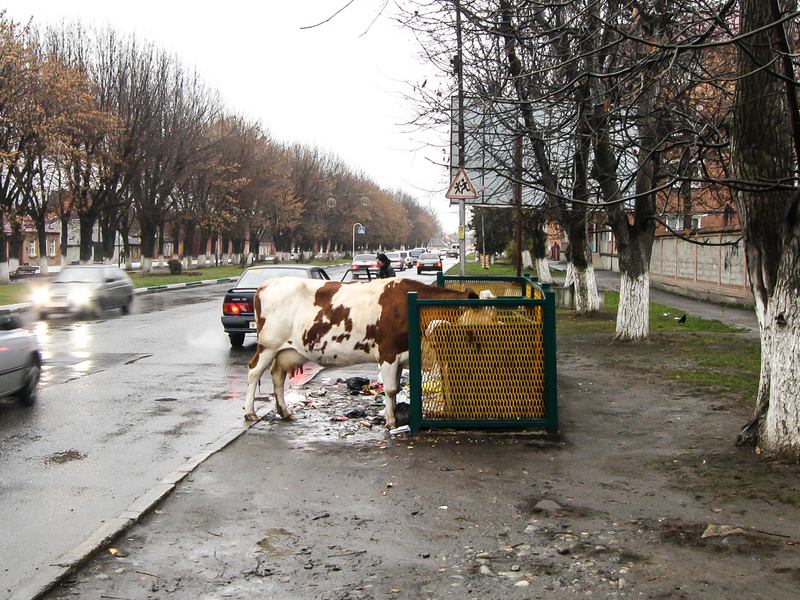 So Ilgar said he could give us a lift, if only we were OK with waiting for a little while whilst he’s doing some chores. 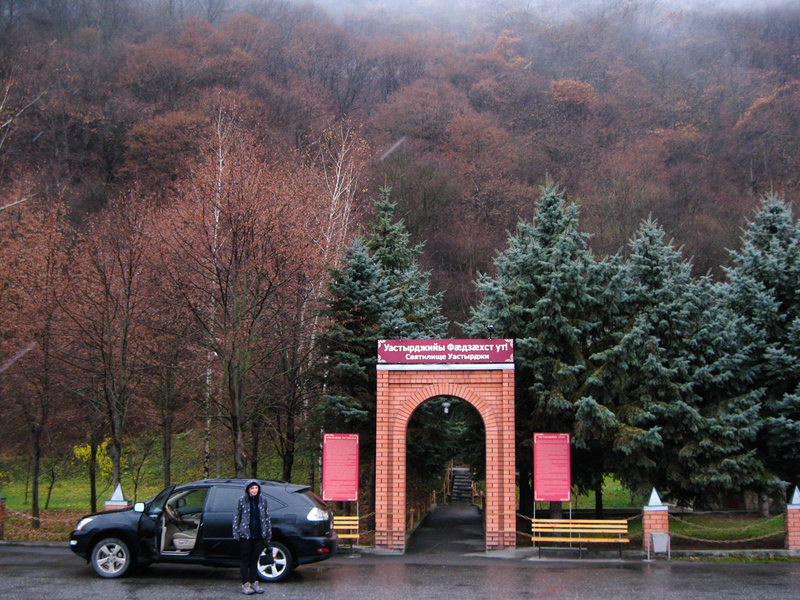 After spending an hour or two at the Vladikavkaz market, we were ready to head to the Russian-Georgian border, hoping it would not be closed because of the weather. 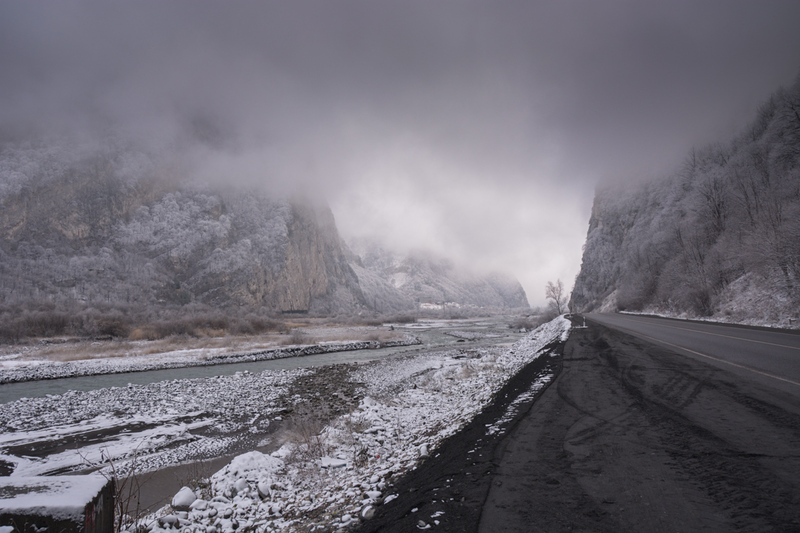 Not entirely believing our eyes, we were storming through North Caucasus, surrounded by endless mountains and cliffs. I could only imagine Dainis’ feelings cycling there. We soon found ourselves already in Georgia and decided to stop at the first given opportunity (around 4 km after the border) and jump out of the car, to set camp before darkness and to give some time for Dainis to catch up with us, hopefully still in the daylight. 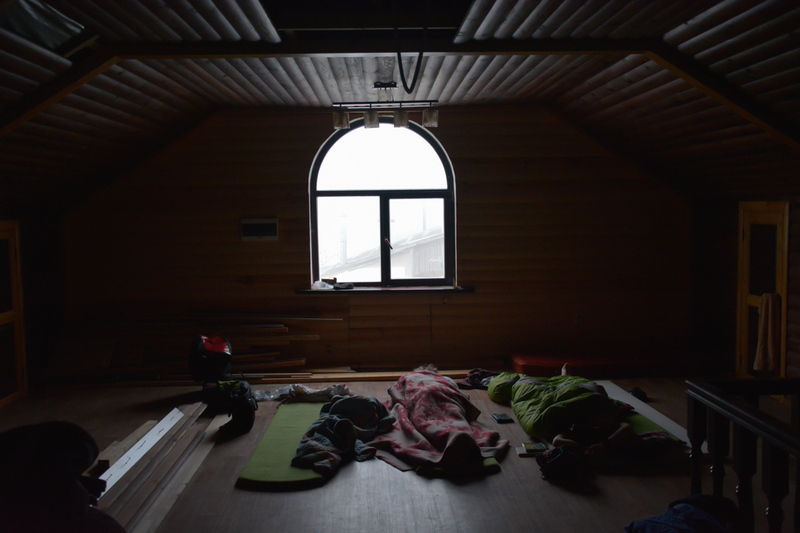 It was getting colder by the minute, but we found shelter by the Gveleti village, at some camping place which was, unfortunately closed. We were lucky enough to find a sheltered spot without snow, which was important for us, thus, a few hours later, Dainis had conquered the distance and we set to bed curled up in all of our clothes, water turning into ice in half an hour or less, but extremely excited to have entered Georgia – the country where we would have to start to plan, think, observe and weigh different options and possibilities for future travels.